In the year 1965 Thunderball movie, James Bond wore two watches - a Rolex submariner and a Breitling Top Time chronograph. Time has been flying fast until 2013 the original movie prop was found in a British flea market where it was sold for only 25 sterling pounds, soon afterwards auctioned for tens of thousands pounds. This is the larger 42mm 1963 reissue chronograph looks like James Bond's Breitling Top Time. On the left side is second sub-dial; on the right side is cumulative 30-minute counter. See-through display case back, on which it prints "China air force new era edition, 2013/50 anniversary". 1963-2013 is 50 years. 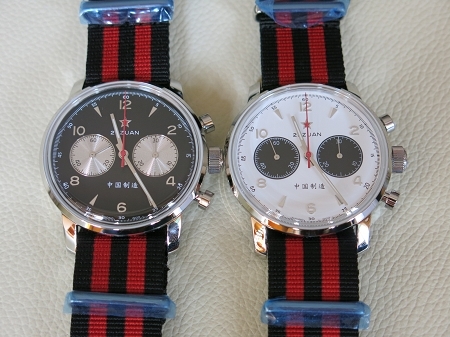 The accompanying nylon band matches the overall style of this chronograph very well. Black face comes with shining silver sub-dials. White face comes with black sub-dials. Please choose at pull-down order menu. Thank you for looking at this product. What's its case and lug measurement in millimeters? Lug width is 22mm. Vertical height upper lug tip to lower lug tip is 47mm. The diameter is 42mm without crown, 45mm with crown. Thickness is 13mm.